In my early childhood, I had Cree stories told to me. The elders who told them taught about a good way of life and how to live it. It was a great event in the old days when people gathered round just to tell stories. Special foods were set aside for the storytellers who were held in high esteem. But legends and traditional stories, often portrayed in children’s books today, do not tell much about our Aboriginal history. 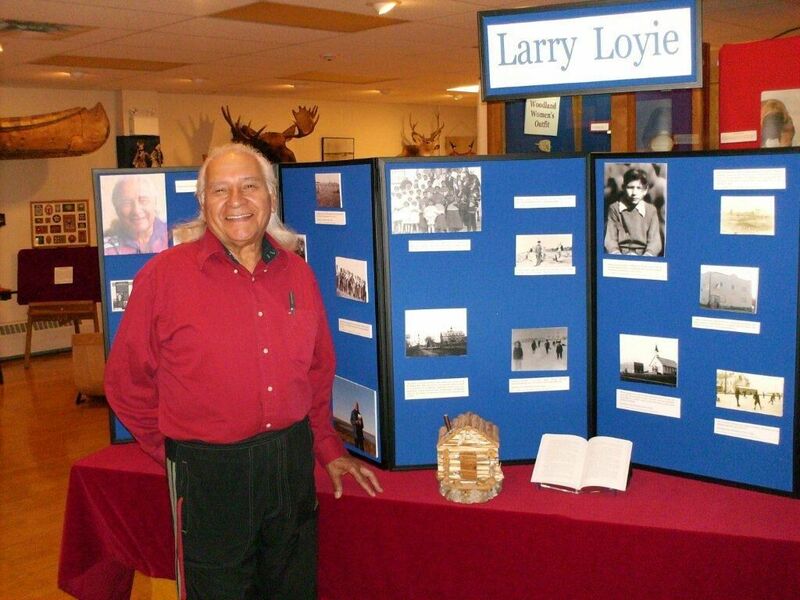 Larry Loyie with the Residential School display at the Native Cultural Arts Museum in Grouard, Alberta. I grew up in northern Alberta in the village of Slave Lake. While in residential school, I lost my mother. With so much hurt inside, I ran away twice. Finally, I quit school at 13 years of age. Looking back on the bad times, I see they inspire my work. At the age of 55, when I began writing about my six years in St. Bernard Mission residential school in Alberta, I concentrated on the good things. Although there were not many good things, they were something to cling to. One day, a story of mine was discussed in a creative writing class. Someone said, “It must have been good in that school.” It was then I knew I wasn’t facing the bad things. Encouraged by friends, I talked with others who shared my experience. Just talking helped me write the truth. As Long as the Rivers Flow (Groundwood, 2002) introduced residential school through the story of my last traditional summer spent with my family. My newest book, Goodbye Buffalo Bay (Theytus, 2008) is the sequel. A chapter book, it tells the true story of my last year in residential school and how I moved on, searching for a place in my family, culture and community. As an author, I had to find a way to write truthfully about my experience. In Goodbye Buffalo Bay, I portray the fear and loneliness that we felt. I also recall what we, as boys, talked about in school to keep us going. In the book, it comes out as funny and lively but when I was writing, the anger surfaced. On June 11, 2008, Prime Minister Stephen Harper apologized to First Nations, Metis and Inuit people on behalf of Canada for a century of residential schools. For school survivors and their families, it was an emotional day. Finally their personal histories and those of thousands of Aboriginal children could be told without fear of denial or reprisal. The prime minister’s apology has made it possible to share this long-hidden aspect of Aboriginal history. I no longer worry that people who read my books or hear me speak about residential school will ask me, “Is it true? Was it that bad in the school?” The truth is out, and I am hopeful about the future. The children are being remembered and honoured at last. The story of residential school is powerful. Children are capable of asking pertinent questions and drawing their own conclusions. At Sir Isaac Brock Public School in Guelph, ON, Sean Cameron’s grade six students shared short essays describing what they would feel if forced to leave their families and live in a residential school. Their essays were effective and moving. Here are some suggestions for learning more and for introducing this topic to your students. Comprehensive, insightful and readable, A National Crime: The Canadian Government and the Residential School System, 1879-1986 (U of Manitoba Press, 1999) by John Milloy, is a highly recommended resource. Many school boards offer background material prepared by Aboriginal educators. Kawartha Pine Ridge District School Board, for example, has published Nurturing the First Nations, Metis and Inuit Spirit in Our Schools, a staff resource that includes residential school information. Where are the Children? is an interactive Internet site exploring “What were the residential schools actually like?” Created by the Legacy of Hope Foundation, Aboriginal Healing Foundation and Library and Archives Canada, the site (www.wherearethechildren.ca/en/ahf.html) includes invaluable research, individual experiences and many family and school photographs. It addresses issues such as the disappearance and/or death of a high percentage of students. Read the prime minister’s apology with the students. 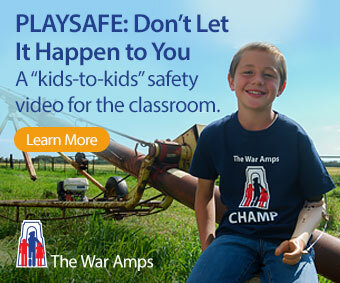 Visit the Where are the Children? interactive website. Share first-hand experiences in books such as As Long as the Rivers Flow and its sequel Goodbye Buffalo Bay. These books include epilogues on residential school. Study material is available at www.firstnationswriter.com. Create a timeline of residential school history. An accurate timeline is included in the study material for Goodbye Buffalo Bay. Discuss why residential schools were established, the short-term and long-term impacts of the schools on children and their families, and how to support Aboriginal peoples in the healing process. Tap children’s imaginations. As in the Guelph, ON, example, encourage students to write first-person short stories on the subject. Ask students to prepare a presentation on residential schools for the United Nations. This exemplar task is part of the Toronto District School Board’s Grade 6 Social Studies curriculum exemplar (“Preparing a Presentation on the Impact of Residential Schools on Canada’s Aboriginal Peoples for a United Nations Forum on Contemporary Aboriginal Issues”). Literature circles using authentic Aboriginal voices are part of the Durham District School Board’s Aboriginal education program. Teacher Arlene Cole uses circles to encourage students to “identify and justify [explain] the Aboriginal’s point of view and Canadian Government’s point of view” regarding residential schools in texts such as As Long as the Rivers Flow. Invite authors and/or residential school survivors to speak to the students. This article is from Canadian Teacher Magazine’s November 2009 issue.